This technology relieves pain by enlarging the space between the discs. 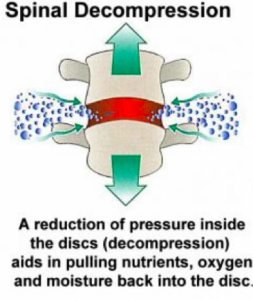 The negative pressure of decompression releases pressure that builds on to the disc and nerves, allowing the herniated and bulging disc to eventually go back into normal position. Decompression is the only treatment that is truly most effective for severe cases of herniation, degeneration, arthritis, stenosis and pressure on the nerve root. According to a clinical study performed by the Orthopedic Technological Review in 2017, said that 86% of all cases experienced spinal pain relief with disc decompression. Many patients with lower back syndromes may experience pain relief as early as the third treatment session. Comparison of pre-treatment MRI’s with post-treatment MRI’s has shown a 50% reduction in the size and extent of herniation. In clinical studies, 86% of patients reported relief of back pain with our system. Within the past five years, some private practice clinicians have reported success rates as high as 90%. Since non-specific low back pain and cervical pain generally encompass a myriad of mechanical failures, including muscles, tendons, ligaments, and other soft tissue that encroach or produce pressure on the nerves, the term intervertebral disc syndrome can be used. This diagnosis does not necessarily require (although recommended) an MRI to confirm the presence of a disc involvement. 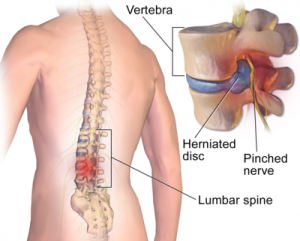 Patients with the following problems or symptoms are usually excluded from using the Spinal Decompresion therapy: Pregnancy, Prior lumbar surgical fusion, Metastatic cancer, Severe osteoporosis, Spondylolisthesis, Compression fracture of lumbar spine below L-1, Pars defect, Aortic aneurysm, Pelvic or abdominal cancer, Disc space infections, Severe peripheral neuropathy, Hemiplegia, paraplegia, or cognitive dysfunction, Cauda Equina syndrome, Tumors, osteod osteoma, multiple myeloma, osteosarcoma, Infection, osteomyelitis, meningitis, virus, and HNP (sequestered/free floating fragment). What Type of Commitments Are Required By Patients? Herniated discs generally respond within 20 sessions, while patients with degenerated discs may need ongoing therapy at regulated intervals to remain pain free. Still other patients, due to lifestyle or occupation, may also require maintenance therapy. Patients with posterior facet syndromes may achieve complete remission with 10 or fewer sessions. Research has demonstrated that most patients achieve full remission from pain after the initial treatment regimen.